Why Is My Air Conditioning System Making Those Weird Noises? Electrical issues tend not to happen too often, thankfully. When they do, however, they have the potential to be devastating. Electrocution, house fires, and other horrible consequences are all possible in cases where electrical issues are allowed to progress far enough. Having a licensed professional check out your electrical system at least once a year is a great way to ensure that it stays in good, safe condition. This is no guarantee that the electrical system will avoid issues, though. You still need to keep an eye out for signs the system is experiencing some kind of problem so that you can call for repairs as soon as possible. The following are just a few of the common symptoms that indicate your electrical system is experiencing problems. If you are looking for a top electrician in Lacey, WA to handle repairs, we’re here for you. Flickering lights are always a sign that something isn’t working properly. If you plug in a different light, and it works fine, then the issue is probably with the light itself. If the flickering extends to multiple lights, however, then you likely have a larger issue. It could indicate you have a short-circuit in your wiring somewhere, or that the circuit breaker is having some sort of difficulty. You’re going to need to have a licensed electrician check out the system to determine for certain what the issue is. House fires often start as a result of electrical problems. This is because when an electrical short circuit happens, the current that flows into the surrounding area meets resistance. The resistance dissipates part of the energy as heat, which can ignite whatever the current is flowing into. If you notice hot spots in odd places on your walls or floors, you should call for an electrician as quickly as possible. The hot spot could indicate that you have a short circuit in your walls, which is a huge risk for starting a fire. An electrical issue that wastes energy in your home has the potential to drive up the cost of your monthly energy bills. After all, wasted energy still needs to be paid for. If your monthly energy costs seem much higher than they should be, it might be because you have problems with your electrical system. You should have it checked, just in case. Your circuit breaker is a key part of keeping your electrical system in good condition. It’s not immune to its own problems, though. 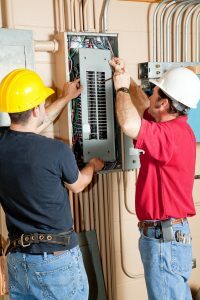 If your circuit breaker is not resetting properly, trips all the time, or refuses to trip when it should, you should absolutely contact a professional electrician to repair it as quickly as possible. Circuit breaker problems are doubly dangerous, because they open the door to other problems in your system the breaker panel can’t stop. Sunset Air offers a full range of electrical maintenance and repair services. Contact us today to schedule an appointment with one of our professional technicians.